President Bashar Assad’s regime now controls more than 90 percent of Aleppo and is on the verge of completely driving rebel forces from the besieged city, the Syrian military said on Dec. 12. More than 300,000 people have been killed in Syria’s war, and more than half the country displaced. The government assault on Aleppo has killed at least 415 civilians since mid-November, according to the Syrian Observatory for Human Rights. Another 130 civilians have been slain in rebel fire on the city’s west over the same period, the Observatory said. 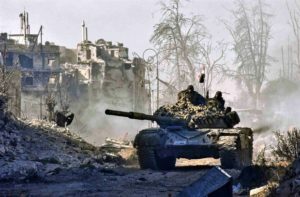 The Observatory said Assad’s forces had captured southeast Aleppo’s large Sheikh Saeed district. The rebels withdrew from six more districts as government troops advanced, the London-based Observatory said. “The battle of Aleppo has reached its end. It is just a matter of a small period of time… it’s a total collapse,” said Observatory director Rami Abdel Rahman. An AFP correspondent in government-held west Aleppo said celebratory gunfire could be heard on Dec. 12 and state television showed people celebrating, holding up portraits of Assad and Syrian flags. “Aleppo residents express their joy at the victory against the terrorists,” read a caption beneath the footage, referring to the rebels. The fall of Aleppo would be the worst rebel defeat since Syria’s conflict began in 2011, and leave the government in control of the country’s five major cities.